InfoComm International is the official co-sponsor with NewBay Media of the Roadshow events. 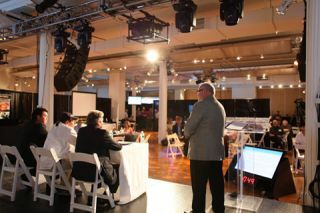 Pictured here: Duffy Wilbert of InfoComm leading the Consulant/Integrator at the July 25th Roadshow in Manhattan. On the heels of a highly successful Roadshow stop in Manhattan July 25th (the most successful and well-attended Roadshow ever)– the InfoComm/NewBay Media Rental & Staging Roadshow will visit the Orlando area Oct. 9th. And the venue will be an exciting one: the Roadshow will take place at the facilities of Full Sail University, in Winter Park (a suburb of Orlando). I’ve worked with both InfoComm and Full Sail staff and faculty this summer to put together what I think will be the most intriguing Roadshow ever, with an industry education and staffing emphasis added to the technical tracks and exhibits. The Full Sail facilities are truly state of the art, and will offer the staging community a rare glimpse inside the country’s premier training and education campus for Audio, Video, and production technologies. There will be, as part of the agenda Oct. 9th, a Special Joint Session for rental/staging community and Full Sail faculty and students: InfoComm will present an introduction to staffing issues/InfoComm Resources for audio, video, recording, and other performance technology students and the industry. And that will be followed by an Industry Roundtable with Full Sail Faculty/Staff and Invited Industry professionals, addressing the topic: “Staffing Issues for Staging, proAV, and Design Companies– Matching the Skills in the Market with Company Needs”. At the July 25th Roadshow stop in Manhattan, 300 industry professionals gathered to network, see new gear demos, and attend up-to-date, in-depth business and technical seminars from Tom Stimson and Andre Lejeune. The event at the Metropolitan Pavilion drew a diverse crowd of staging pros, AV rental companies, and this year for the first time—installed AV pros. WorldStage (formerly known as Scharff Weisberg) was co-host of the Manhattan Rental & Staging Roadshow. InfoComm International is the official co-sponsor with NewBay Media of the Roadshow events. The Roadshow featured hands-on product demos from exhibitors, Almo Professional AV, Analog Way, AV Stumpfl US, Broadfield/Green Valley, Christie, Conference Rental, Da-Lite, Digital Projection, Drape Kings, Flex Rental Solutions, InfoComm, IntelliEvent, Interspace, Kramer, Nationwide Wholesale Video, Panasonic Solutions Company, Premier Mounts, Sonic Foundry, Sony, Take 1 Insurance, and Video Equipment Rental (VER). The Roadshow covers the most important issues in both the business side and the technical side of the industry. The Rental & Staging Roadshow packs a ton of information into a single day.